How cute are these? I got these monkey magnets from Mostly Magnets through a giveaway at Rants In My Pants. Wow, many prepositional phrases. OK, clearer -- I entered a giveaway to win these magnets. My youngest noticed that I had put them up. I asked if she liked them, and she answered by holding up the (open mouth) "Ooo!" and (smile with teeth) "I like" magnets. I am very impressed by the strength of the magnets. And the images are so very cute. Whether they are used with the magnetic words or for keeping track of hair cut coupons, I'm hoping they bring more smiles into our house. My son's art teacher said that "G of GAIN" was the best stitcher she's seen and that I must have taught him how to sew. 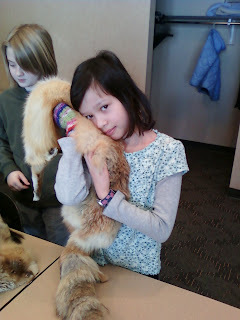 She showed me the standard large 1/2" running stitch of other 6th graders, no backstitching, then showed me G's work.\ with neat, small, tightly-spaced whip stitches. He made "regular clothing" for a wire sculpture person -- a shirt, pants, and hat. I did not teach him how to hand stitch. I made the materials available and let him have time to figure out the best way to use them. I didn't teach him to use a whip stitch or a running stitch, either. He determined that on his own. I would say that my crafting has evolved the same way as G's sewing skills -- self-learned. 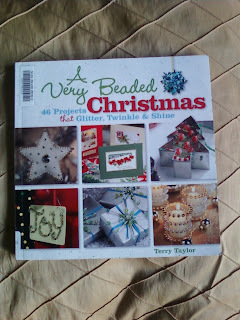 Today, in addition to three blocks of the crazy quilt, I scanned through this beading book today. I can't say that I've done any beading outside of knitted jewelry such as this attempt and a few bracelets (pattern purchased from Donna's, a store in Valley Junction that is now closed). I found this book at the library. It has instructions for some nice felt ornaments that remind me of my young childhood. I received just one felt ornament after my teenage years. I will probably do some prototypes to determine the cost with respect to difficulty and time. The use of beads puts the ornaments on a higher level than those without, and I'm looking forward to trying something new. I've been making 8.5" square crazy quilt blocks with backing. The backing is new for me, and was suggested by my older kids and a book. Using muslin to stabilize does add stability, but it also decreases my freedom somewhat. I liked the non-backing squares because I could "trim as you go" -- sew a seam to join, then trim the excess. With a backing, you just can't work that way. Plans are to make the wonky houses from earlier into 8.5" squares by adding to the edges or trimming the edges. This means that the houses will have a lawn! Maybe I'll end up embroidering a tree or two as well. As upper elementary students, my kids are able to finish their school work between 10 a.m. and 1 p.m. So they're watching the History Channel (Indiana Jones, oooo!) and making a latch hook rug and a model of wooden dragon. Everything has been 'off' with this stuff. And don't get me started on tomorrow, which is unusally busy. Not our normal week. So i've worked only two days to get some painting done. Take a look at progress from day one and most of day two. I've made some progress on this picture (Monday), and on Tuesday's picture, but the rest of the week's paintings have not been painted. I am finished with my latest prayer shawl. A recent message from my college roommate asked how to start a project when you aren't going to finish right away. I think that's what she said. There are four solutions to this question. I don't finish everything. Some things, like scrapbooks, will never be finished. Inherently won't get done. Ever. I just let it go. So my desk and chair and space around the desk and chair are filled with things that will "some day" get into a scrapbook. I was able to contain everything IN the desk for a long time, but I don't see that happening again for a while. Second, some things don't get finished quickly, but I can hide some Works In Progress, like yo-yo's. Small enough to stow in a paper bag, then in my purse or drawer until I'm ready to work again. Knitting supplies go into a carved wooden chest. Fourth, Then other things are left out until they are finished. Seeing the mess serves as a reminder says, "HEY, FINISH THIS PROJECT ASAP!!!" For example, my youngest undertook valentine making for my two siblings and Mr. TellBlast's seven siblings and their families, and grandparents. That's a lot of card making. And a lot of mess. Every time you walk by, you think, I ought to sit down and make a valentine. And to her credit, she does. I publicly announced my birthday this year, and with a birthday comes cards. Maria gave me this handmade card on the right. My brother wrote something obnoxious about my age inside, so I won't show that part of the card. Last night, during a thirty minute wait to start a movie (Hoosiers) laid down by my husband, I made an inspired card, the one on the left. You can see where her card inspired mine -- the happy birthday strip of paper, the brad, the package with ribbon. But I had no patterned paper (hers was really nice). I stamped my own pattern on the background (it says 'friend to friend'), and stamped 'happy birthday,' too. letter. by. letter. I wasn't really careful with the 'a' stamp, so while I cleaned it on the scrubby pad, the rubber tore away from the foam. I used a glue dot to repair it. I don't feel incredibly bad since I paid $1 for the entire mini-alphabet, but then again, I use this set frequently, so I do feel bad in that regard. But I guess I've gotten my money's worth. We use "puzzling" as a verb. I think G of GAIN came up with this as a youngster. He still finds certain words "fun to say." He is a little like Buddy the Elf, always has been. Below is the puzzle that mostly I have worked on. It came from my mom. G of GAIN thought it looked really cool when she delivered it -- guys and horses on top, with wolves cleverly looking like a reflection in the water. She said, "It's almost reversible." Of course, G's put in only five pieces. A of GAIN is the same way -- "It is so cool. I love that picture." She put more pieces in the puzzle than G, perhaps 30. She sorted a LOT of the pieces, without anyone asking, which helped me immensely. This is what is supposed to look like. But I think I'm done. This might be the first time I've called "Uncle" on a puzzle. Were we fashionable or what? Last weekend, my brother came over and brought a box of clothes he found in the basement. It was labelled "8-83," as in August of 1983. Many of the clothes were handmade. We found a lot of crunchy elastic and a lot of plaid. Also, a stack of Highlights for Children. I always wondered what a highlight was. I think I learned the definition in my teenaged years.